The sales profession continues to be frowned upon and looked at in a negative light. My goal is to make people think about sales differently. It's not about closing the deal right now, it's about the impact you make and the reason you're in sales to begin with. You must have a purpose and that purpose will drive your performance. 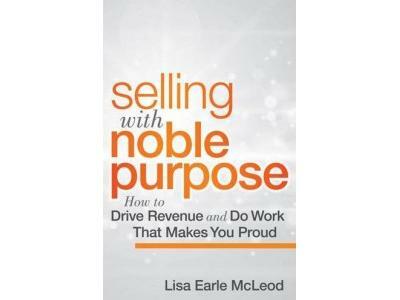 Lisa Earl McLeod, the bestselling author of Selling with Noble Purpose was on to discuss what sales is and should be about. If you think sales is something that should be avoided, wait until you hear this conversation. -A sales leadership consultant whose clients range from financial services to pharmaceuticals. -A sought-after leadership and sales keynote speaker who has rocked the house everywhere from Apple to The United Way. -A prolific writer who has authored 4 books in 3 different genres, business, personal development, and humor. Her syndicated column – How Smart People Can Get Better At Everything - appears in daily newspapers and popular web sites. -A problem-solving expert whose conflict resolution book was hand delivered to every member of the 2011 Freshman class of Congress. -A humor writer whose essay collection Finding Grace When You Can’t Even Find Clean Underwear was endorsed by Betsy Bombeck and featured on Oprah.com.